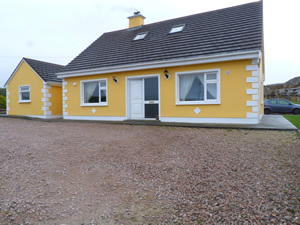 Carna in Ireland-West is a perfect choice for a great holiday or a fun short break in County Galway. Find out more about Carna below. Situated in the unspoilt uncommercial heart of Connemara just 3 miles from Carna village home to three pubs, grocery shop, post office and hotel. It is 50 miles from Galway city and 25 miles from Clifden, the capital of Connemara. This home away from home is a great family house with sleeping to accommodate ten but seating/dining best for six so when children retire at night the adults have more comfort. Nicely decorated with a newly refurbished kitchen which also enjoys a wood burning stove. A short stroll takes you down to a wonderful coral beach and the lanes and byroads are great for walking and cycling.Shop. Pub. Restaurant 3 miles. Beach 880 yards. GF: lounge, kitchen, dining room, 4 doubles, twin, bathroom, shower room.Oil by meter read and electricity by meter read, open fire with starter pack, wood burner with starter pack, linen and towels included, sky, dvd player, stereo tape player, CD, freezer, microwave, dishwasher, w/machine, dryer, alarm clock, uk tv channels, welcome pack, partially enclosed garden, garden furniture, private off road parking. One pet welcome. Carna is family friendly self catering. We have the following details listed regarding Carna accommodation accessibility but we would recommend that you always confirm these prior to booking with the owner or operator. Carna is a great base to explore the wonders of County Galway and you will find plenty of activities near by. Carna is at Connemara, County Galway. Check out the map below for directions, use the controls to zoom in. If you have stayed at Carna why not add your thoughts, comments, pictures to our Facebook page? Don't forget to add the name/town/page link to your comment so its attributed to the correct place. Please keep it polite, we are sensitive souls! Find Cottage Holidays works closely with independent cottage owners and leading holiday travel operators to provide you the widest choice of self catering accommodation across Ireland. Carna in County Galway is available through: Imagine Ireland. If you are heading to County Galway then check out our guides to local holiday attractions, gardens to visit and county shows to see.